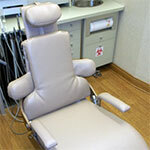 Since 1986 Miller Upholstery has specialized in the reupholstery of dental chairs. 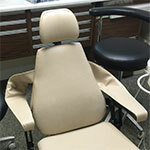 In that time we have done thousands of chairs of all makes and models. We frequently have shown at the Wisconsin, Indiana, Michigan and Iowa state dental conventions, as well as the Rocky Mountain Regional convention. 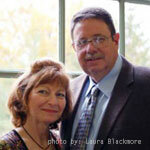 We have been regulars at the Chicago Midwinter Meeting since about 1990. We have references available from our entire service area. 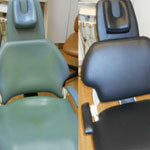 "Thank you so much for doing such a great job on my dental chairs. They look great and I am very pleased with the work you did. …I will call you if I need more chairs recovered." "Thank you for your hard work, time and talent. 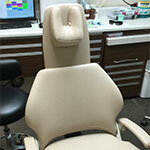 The chairs are beautifully crafted and help make our operatorys professional looking."